Jeff Dahn obtained his B.Sc. in Physics from Dalhousie University (1978) and his Ph.D. from the University of British Columbia in 1982. Dahn then worked at the National Research Council of Canada (82-85) and at Moli Energy Limited (85-90) before taking up a faculty position in the Physics Department at Simon Fraser University in 1990. He returned to Dalhousie University in 1996. At Moli, he did pioneering work on lithium-ion batteries. 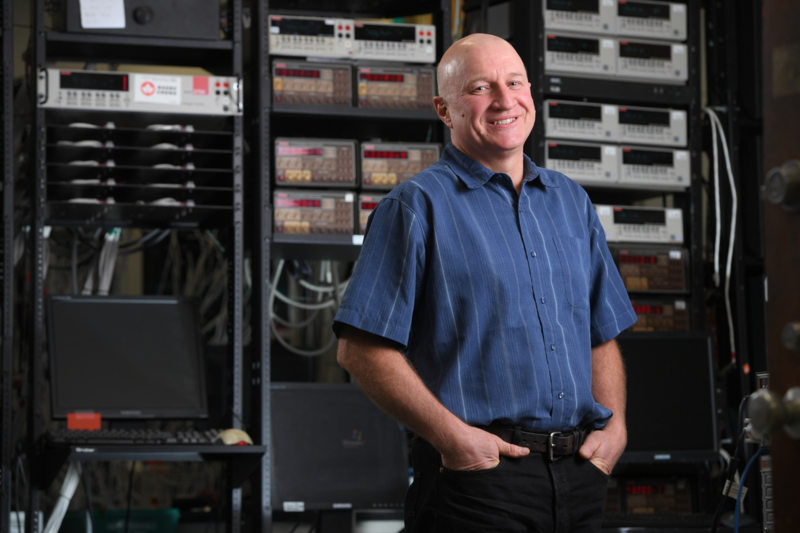 Dr. Dahn was appointed as the NSERC/3M Canada Industrial Research Chair in Materials for Advanced Batteries at Dalhousie University in 1996, a position that he held until 2016. In 2016, Dr. Dahn began a research partnership with Tesla Motors as the NSERC/Tesla Canada industrial research chair. Dahn’s research in the lithium-ion battery field has been recognized by numerous awards including a Governor General’s Innovation Award (2016) and the Gerhard Herzberg Gold Medal in Science and Engineering (2017), Canada’s top science prize. He was awarded the Canadian Association of Physicists Medal for Excellence in teaching in 2009. Dr. Dahn’s wife Kathy, daughters Hannah and Tara, and son, Jackson are all Dalhousie graduates. They all reside in Halifax, Nova Scotia. Abstract: Why do lithium-ion batteries eventually die and how to improve the situation? Lithium-ion batteries used in smart phones last several years. However, they must last at least a decade in electric vehicles and many decades in electrical energy storage systems. In this lecture I will explain why Li-ion batteries eventually fail and introduce simple methods we have invented to rank lithium-ion cell lifetime in experiments that only take a few weeks. These simple methods are crucial for researchers, battery manufacturers and users who cannot test new battery chemistries for years and years to identify better batteries. Glenn Amatucci received his B.S and Ph.D. from Rutgers University in 1992 and 1995, respectively. From 1991 to 2003, his research was focused on the study of lithium and other non-aqueous energy storage devices with Bellcore and Telcordia Technologies’ Energy Storage Research Group (ESRG). He was the Director of the group from 1998-2003. In 2003 he and his group joined Rutgers University. Glenn is currently a Professor of Materials Science and Engineering and a member of the graduate faculty of the Department of Biomedical Engineering. He is also the associate director of a U.S. Department of Energy (DOE), Energy Frontier Research Center. Professor Amatucci has authored or co-authored over 100 refereed papers, two book chapters, and has been granted 33 U.S. patents and multiple international patents, two of which resulted in an R&D Magazine top 100 technology. His current research focus is on the enabling of new energy storage and conversion chemistries and devices through the use of novel nanocomposite electroactive materials to address the extremes of the power/energy spectrum. The enabling importance of electrochemical energy storage to the functionality of biomedical, IOT, personal electronics, electric transportation and renewable power devices and systems cannot be overstated. Within the confines of the battery pack exists an extremely dynamic world of electronic and ionic transport coupled with atomic lattice structures undergoing significant and sometimes amazing architectural transformations all occurring with every charge and discharge. This talk will overview this hectic world which exists within your battery and explore a few next generation pathways in order to make that battery last longer before your next charge. Edward Burgess helps to lead Strategen’s utility and government consulting practices. He specializes in evaluation and design of policies and programs to advance deployment distributed energy resources, demand-side management programs, energy storage and grid integration of renewable energy. Ed has served clients in the renewable energy, energy efficiency, and energy storage industries, including several Fortune 500 companies, major energy project developers, trade associations, utilities, government agencies, universities and foundations. His analysis has given companies strategic insight into clean energy investment opportunities and has helped to guide regulations and policies in many states across the country, including New York’s recent adoption of a 1,500 MW energy storage deployment goal. Abstract: Recent trends in U.S. energy storage markets and policies. Over the last decade, the power sector has seen increased interest in and deployment of grid connected energy storage technologies. Increasingly, battery technologies are being used to provide wide variety of services to the power grid. These deployments have ranged from large scale projects connected to the bulk power system to smaller distributed scale assets directly serving customers. This trend has been enabled by a variety of factors including declining battery technology costs, policy actions at the state level, and through wholesale market reforms. As the amount of variable renewable energy continues to rise, the role of grid connected storage technologies is likely to become only more prominent. This talk will provide a high-level overview of global storage market and policy trends, with a primary focus on the U.S. I will also discuss how the role of grid-tied storage should be evaluated going forward and what steps can be taken to identify and encourage the highest value use cases of energy storage. Center Director for Grid Integrated Vehicles. testimony, and lectures widely on offshore wind and electric vehicles. He has published widely in the scientific and technical literature. Kempton has been awarded four patents related to electric vehicles and the grid. San Diego, which is commercializing Grid Integrated Vehicles. Many state and country aspirations for renewable generation now exceed 50% of electricity. At such high levels, some electrical storage is desirable to manage the grid. My group at the University of Delaware has created, and now has implemented, refined, and tested the use of electric cars for grid storage. This talk will describe how electric vehicles can be used for large-scale grid storage, and how this concept has been implemented and is now being commercialized.